HELP YOUR CHILD SLEEP THROUGHOUT THE NIGHT! 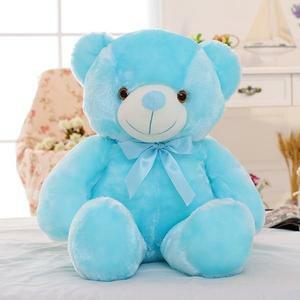 This luminous teddy bear is very soft, indispensable at the birthday party, perfect for children's day gift or for surprise gift for your girlfriend. Equiped with a 7 colors LED, you can use it like a night light ! If your child is afraid of the dark, the gorgeous lights will illuminate and comforts them. Works with 3 AA batteries (not included), just press the button on the right arm, and it will turn on, to turn off just press again. It is approximately 50 cm and it's made with cotton.